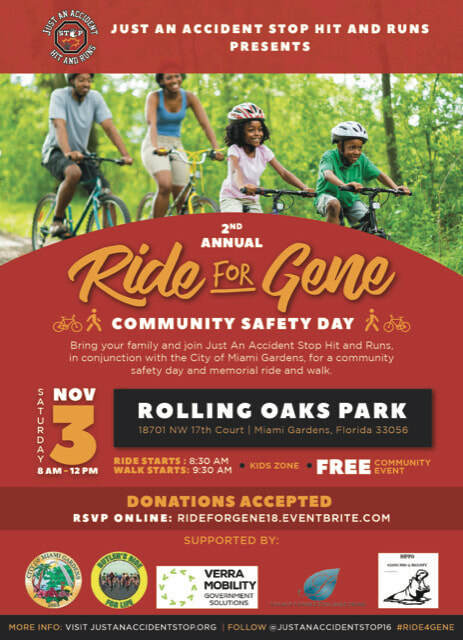 2nd Annual "Ride for Gene" Community Safety Day, on Saturday, November 3, 2018, from 8 am to 12pm at the Rolling Oaks Park 18701 NW 17th Court Miami Gardens, Florida 33056. This event is a collaboration of Just An Accident Stop Hit-and-Runs and the City of Miami Gardens to address the growing epidemic of Hit and Runs through awareness and prevention. This event is Free to the public and will provide a platform for us to amplify our message of staying on the scene in the event there is an accident. As a vendor, your participation in our signature "Ride for Gene" Community Safety Day Event would assist us in fulfilling our mission to save lives.